I’d first like to apologize for taking so much time in between this post and my last one, but I’ve been pretty busy with other musical projects…I could talk about what they were, but let’s not waste any more time, right? This time, we’re back with another rap analysis, not the orchestrational analysis of Dr. Dre’s production that I had originally planned to release this week (although that analysis can be read here.) This time, we will be taking a look at a rapper that, quite simply, everyone should know about. The fact that this girl has to struggle to eat (figuratively) blows my mind when you consider some of the trash out there (Drake, current Lil Wayne…yeah, I went there.) She has a really interesting history, personal and professional (she once made a craigslist post offering 16 bars for $800 cold), and I encourage you to look it up if her rap grabs and amazes you like it should. But without any further delay, introducing: Miss Jean Grae. Jean comes from NYC (actually raised/lived in the historic Chelsea hotel), and she reps the city well. Currently, she’s on Talib Kweli’s label, and you’ll notice that many of the songs we look at either have Talib on them or came from a Talib album called “Gutter Rainbows.” (In fact, I have — uncoincidentally — analyzed Talib Kweli’s own signature flows in an article that you can read here, as well.) We’ll do a short review of concepts we’ve addressed earlier for the newbies, but I’d really like to get to new material as quickly as possible, so I’ll only gloss over concepts like accent and address them insofar as they are relevant here. If you’re looking for a more in-depth discussion of those concepts, check out my Nas post on his verse from the 2006 Busta Rhymes song “Don’t Get Carried Away,” which is on my site over here. We’ll use techniques and tools that we’ve used in the past to analyze the music. 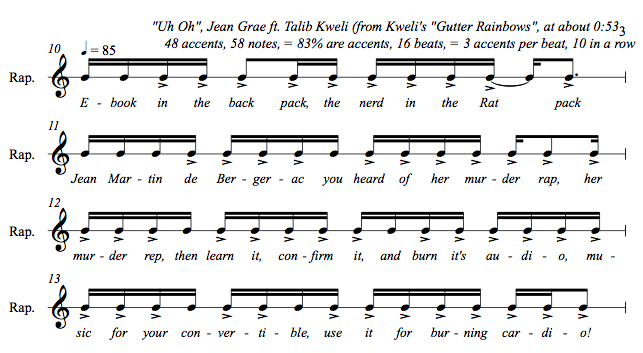 For instance, if you count, you’ll notice that in this rap of about 6 bars there are 63 notes. 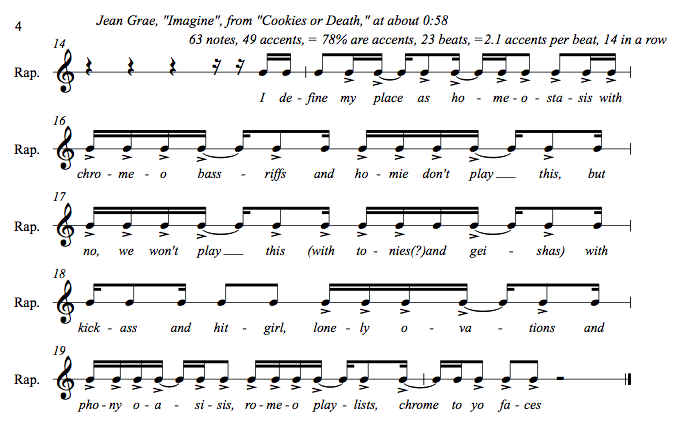 However, the amazing thing here is that a full 49 of those notes are accented. That means about 78% of the notes are accented, which over the 23 beats included here, works out to about 2.1 accents per bar. Now, this is amazing. Consider that there are only 4 sixteenth notes per beat; this means that on average, half of them are accented. Compared to what we’ve seen before, in my Eminem analysis, we saw that Eminem, over 8 bars, averaged a little over 1 accent per beat, which in itself is amazing. Well, Jean does twice that (although over a shorter time span, and on more than one syllable, unlike Eminem.) I really would like to impress on the reader just how impressive this is. I have a pretty extensive rap listening background, and I can say that no one else who I’ve heard tops this high concentration of accents, and very, very few even come close. I’ve termed this phenomenon, a hallmark of Jean Grae’s style as we shall see, “hyper-intense accenting.” She fits as many syllables as possible into an incredibly short time span. Because this limitation doesn’t seem to exist for Jean. She seems to always locate the exact words with the maximum amount of accents to say what she’s trying to say. There are an infinite amount of ways to express the same idea as “I define my place as homeostasis”, but she comes up with the one way that fits in the most amount of accents. The entwining between what she wants to expresses and the exact words she uses is flawless. It should be very, very clear that this is not true for all rappers. Again, I regret mentioning Busta in a negative context. This might not be the most glaring example, but it illustrates what we were talking about before from the opposite point of view. Busta immediately limited his options when he started with the line “I’m like Shaq, the franchise player just got traded,” and then worked from there. This exact thing just doesn’t seem to happen for JG. All of her lines in these examples are related, they all lead clearly in their ideas from one to the other, and they always make sense. Finally, we should mention that Jean manages an astounding 14 accents in a row, from “phony oasisis” to “chrome to yo faces.” Not bad. Also, note that the 5 syllable block rhyme (a rather large block to try and pull off, speaking to her rhyming skills) doesn’t always occur in the same place metrically. Most occur on the full 4 sixteenth notes of the beat and then has the final syllable on the 2nd sixteenth note of the next beat, such as in “no we won’t play this”, but she varies this; for example, “homeostasis” (that opens the verse) and “chrome to yo faces” are different. They start off the beat, on the final 16th note of the beat, and then ends differently as well. It is laborious to describe such things verbally; the reader is encouraged to observe how “homeostasis” and “chrome to yo faces” differ from the other instances of the same 5-syllable block rhyme. This variation keeps the rhyme sounding fresh in our ear; alternatively, it places emphasis on the final message of the verse, sounding different from what surrounds it as it does. There are 58 notes in these 4 bars. And there are 48 accents. That works out to saying that about 83% of the syllables are accented. 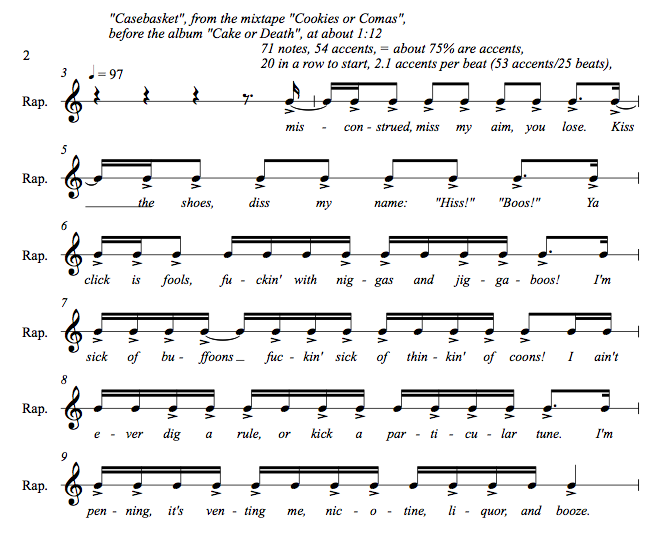 And, occurring over 16 beats, there are 3 accents per beat. 3. With 4 sixteenth notes per beat, that means that 3 out of every 4 sixteenth notes per beats are accented, which is the metric level to which most rap is reduced to (most rappers rap at the level of the 16th note.) (I’ve also erred on the side of accenting too few notes rather than too many notes, just so that the effect of what exactly Jean is doing comes across as strongly as possible. For instance, one could argue for an accent on the syllable “con” from the word “convertible”, because of it’s repetition in “confirm” and because of alliteration with the word “cardio”, but I decided against it to guard against inflated accent numbers. Like with most things, there is an amount of interpretation that goes into choosing what notes are accented and which aren’t.) Compare this rate to others: look at rappers who are considered all-time greats going back, to the early 90s era, the so called Golden Age of rap. On average, their raps all had rhymes only at the end of lines; that means 1 rhyme (1 accent, same thing for our purposes here) every 4 beats. That’s .25 accents per beats. Jeanie raps at a rate that’s 12 times that, by placing 3 accents per beat. What’s more is, as we’ve mentioned before, it always makes sense. Not bad, but it makes us look differently at rappers like Guru, who is important for his lyrical content, but not necessarily for his musical contribution (although one could argue that these greats were important because they built the foundation for what would come later.) And here is where we need to step back a bit. Now, Jean’s rap is obviously a lot more interesting than what I found in my study of the 23 most repetitive rappers in the industry today, which you can read here…and yet, some of those other rappers, like will.i.am, might be better known? Interesting. Thanks! Hope you enjoyed this analysis! And, if you did, you’ll probably want to check out my 2 articles on Kendrick Lamar — one on his album “good kid, m.A.A.d city” here, and one on his album “To Pimp A Butterfly,” here. Dude, doin' it again! I am DEFINITELY gonna pick up her mix tape. She's ridiculous! Sick flow. I love readin' this stuff, so keep it up! This is one of the coolest things I have ever read… Thank you. Thank you so much for this piece. Jean is a longtime favorite of mine, and it is fantastic to get a new perspective on her work. I'll listen to rap music in a hole different way after reading this blog. Thanks for sharing your knowledge! her flow is really amazing. I admire her! "consider me the entity within the industry without a history of spittin the epitome of stupidity”…just wow"
To me, that's the epitome of corny. It's a prime example of Talib Kweli stringing rhymes together without much consideration for how silly what he's actually saying is. And for the record, he does have a history of spitting stupid rhymes. That's similar to what Em does in the first verse of "I'm Back " from the Marshall Mathers LP. I think you're right. Eminem is probably my top rhymer of all top, not necessarily top rapper, although he's gotta be top 3. I think I go Eminem, Nas, Jean, in an as yet undetermined order. I don't understand why accent density is necessarily an indicator of talent.